He may have lived a 19th-century life, but his ideas keep coming back with a vengeance. The many biographies of Karl Marx bring out a basic paradox in Marxism. Biographies are typically narratives of the lives of important figures who loom large against the backdrop of history. Yet Marxism, or “the materialist conception of history,” as the young Marx and his friend and collaborator Friedrich Engels called it, warned from the start against reading the past as the affair of solitary individuals rather than antagonistic classes. In particular, they argued that abstract ideas grew out of material circum­stances instead of the other way around—and yet what secular ideology or political tradition emphasizes the special contribution of a lone thinker more than Marxism? Marx himself would have been sensitive to this paradox. Of the half-dozen most important books in his bookish youth, one was a biography that downplayed the importance of a famous individual by the name of Jesus of Nazareth. David Strauss’s Life of Jesus was published in 1835, when Marx was in his late teens. Strauss didn’t deny the validity of Jesus’s teachings or question his historical existence; his book scandalized or, as in the case of Marx and Engels, excited German readers by arguing that the events of the Gospels weren’t factual occurrences but myths, collectively dreamed up by early Christians many years after Christ. Bruno Bauer, Marx’s mentor when he was working on his dissertation in Berlin, went further and declared Jesus an outright invention of the Gospel writers. The point was not, however, to undermine the “absolute idea” (in Bauer’s Hegelian vocabulary) of Christianity; it was to establish “human self-consciousness as the highest divinity,” as Marx (borrowing another Hegelian term) summarized the argument. Sacred truths were to be recognized as collaborative human artifacts, without necessarily forfeiting their truth in the process. All of this may be so, but it leaves another problem intact: Why do some rare individuals become the vehicles of universal ideas, when almost all others do not? Socialism and communism predate Marx, and an international workers’ movement would have arisen in the 19th and 20th centuries had he never lived. (Of Marx’s eight siblings, only three saw the age of 25.) But Marx did live to write Capital and other evidently imperishable texts, and so we are left to contemplate an intellectual current and political tendency that has cited him at every step. His thought so deeply in­flects later history that his and Engels’s dictum about the nature of historical change—“Life is not determined by consciousness, but consciousness by life”— can appear upended. In perhaps the most enduring biographical portrait of Marx in English, the chapters devoted to him in Edmund Wilson’s To the Finland Station (1940), Marx culminates a series of historical thinkers that begins with Michelet and inaugurates a lineage of political actors that ends with Lenin. Wilson’s perspective belongs to the 1930s, the decade in which he wrote the book, and there is also a hint of self-portrait in his description. This Marx is at the center of the ongoing enterprise of mastering—­in the senses both of understanding and controlling—history, even after he finally collapses over his worktable as another man might die in battle. The heroic image didn’t survive the fall of communism. But the decades since the end of the Cold War have been something of a golden age of Marx biographies, with the ongoing publication of the collected works of Marx and Engels in a reunified Germany permitting researchers a fuller and more disabused understanding of Marx’s life. Among full-length biographies, Francis Wheen’s brisk and gossipy life from 1999 tells the most entertaining story, while Jonathan Sperber’s 2013 effort delivers the richest work of history. 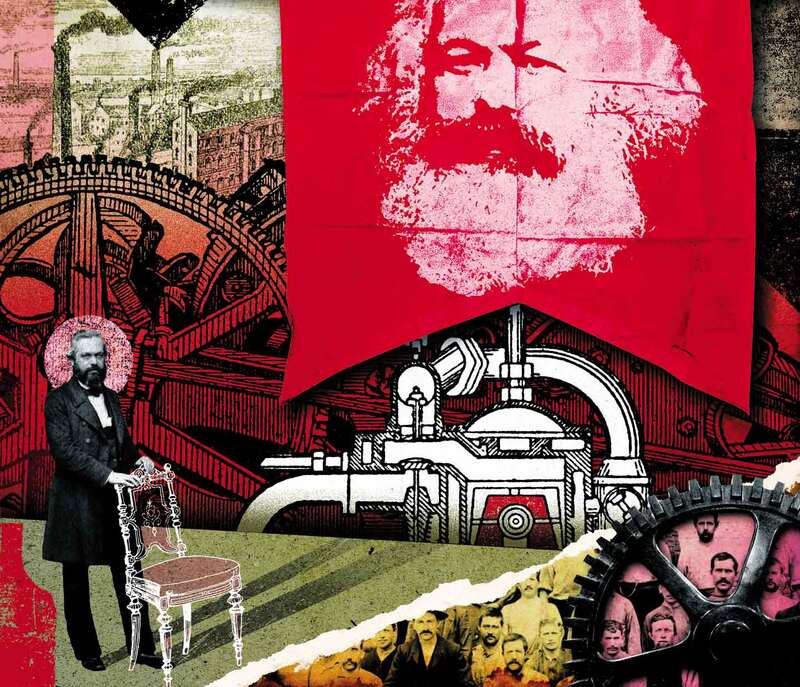 In 2006, David McLellan published a revised edition of his 1973 book, simply titled Karl Marx: A Biography, for a generation the standard account and still the best-written and most psychologically acute. In restoring Marx to “his nineteenth-century surroundings,” Stedman Jones would like to replace the mythical or, more accurately, heroic image of the man with that of a mere historical character, personally flawed and politically confused. Throughout the book, he accordingly refers to “Karl” rather than “Marx.” The device of insolent familiarity (as if a guy called Gareth weren’t quite due the respect of someone named Stedman Jones) is misleading, since Marx’s family didn’t call him Karl but “the Moor,” on account of his dark complexion, while Engels addressed his letters “Dear Marx.” But Stedman Jones’s convention entails a serious implication: If “Karl” essentially belongs to the 19th century, then Marx can’t be too relevant to the 21st, and we ought to go about our thinking and organizing without him. Stedman Jones chides the teenage Marx for “a high degree of self-absorption” and speaks of his “infatuation with the idea of himself as a poet.” But you don’t often get a kid as bright as Marx without some self- absorption. Nor was Marx wrong in the estimate of his verbal gifts; in adulthood, they simply went to prose instead of verse. The summer he was 18, Marx became engaged to a young aristocratic woman, four years his senior, named Jenny von Westphalen, for whom he copied out these lines: “Jenny! Do I dare avow / That in love we have exchanged our souls / That as one they throb and glow / And that through their waves one current rolls?” As overheated juvenilia go, this pledge of union was not inaccurate, in a darker way than either youthful soul-exchanger could guess. Seven years into their engagement and not long after the death of Jenny’s wary father, she and her bourgeois suitor wed at last. Together, Jenny and the Moor (who some 20 years later was proud to note her lasting reputation as “the most beautiful girl in Trier”) would endure exile, much hardship and illness, and the death of four children. “Every word is Deed and Fire / And my bosom like the Maker’s own,” Marx’s poem went on. The ambition of all committed writers is that words should amount to fiery deeds, but Marx was not at first a dedicated agitator or writer. In his early college days in Bonn, he preferred drinking and dueling; only after transferring to the University of Berlin did he buckle down to serious study. Disappointed not to have obtained a teaching position after submitting his dissertation on the materialist philosophy of Epicurus, he went on to a peripatetic career as a journalist and editor. Governments were often restoring Marx’s freedom by expelling him. Flight to Paris with his new bride established a pattern that would hold across the 1840s: Marx arrives in a new city, entangles himself in revolutionary politics and seditious journalism, and before long is ordered out of the country. In Paris, Marx joined the radical League of the Just and founded the Deutsch-­Französische Jahrbücher, or Franco-German Yearbooks. Its sole issue, which contained an article by Engels, “Outlines of a Critique of Political Economy,” that might reasonably be considered the founding document of Marxism, inspired the Prussian government to issue arrest warrants for Marx and his colleagues. Marx also contributed to the Paris-based German-language socialist journal Vorwärts!, or Forward!, until the French Ministry of the Interior shuttered its offices. Displaced to Belgium, he became president of the Brussels chapter of the Communist League. This “interna­tional association of workers”—in reality, a minuscule secret society—commissioned Marx to draw up a program. Hastily composed in early 1848, The Manifesto of the Communist Party both anticipated and, at least in Germany, abetted the revolutions that broke out across Europe later that year. Arguably the most famous pamphlet ever written and the most important piece of universal literature since the Quran, the Manifesto had been all but forgotten a year after its publication, when the revolutionary mood ebbed away. The month after it first appeared, Marx, under suspicion— incorrectly, it seems—of using an inheritance from his mother to fund insurrection, was ordered to leave Belgium. Marx ventured a return to Cologne in the revolutionary year of 1848 to launch the Neue Rheinische Zeitung, only to see the radical daily suppressed the following year. A final issue, printed in red ink after Marx was ordered to leave Prussia within 24 hours, declared for a revolutionary “social republic.” Stedman Jones faults the Zeitung for opposing the new Prussian Constitution, which, by establishing a national assembly, diluted the king’s authority while leaving the monarchy intact. Throughout this biography, he complains that Marx missed the centrality of political representation, as distinct from economic power, as both a goal and a means of working-class struggle. The criticism is fair and important, but Marx’s skepticism toward piecemeal democracy was borne out by many of the events he witnessed. The continent-wide revolutions of 1848 produced no social republics but only, in varying combinations, absolutist reaction or bourgeois enfranchisement. The quandary over bourgeois democracy has hardly been solved since. In the early 21st century, it is difficult to feel that liberal theorists have ever satisfactorily explained how the franchise should either compensate for or one day overcome the absence of economic justice in capitalist society. Marx and his growing family (there were now three children) crossed the English Channel in 1849. England was by this time a stable enough capitalist and parliamentary state that it could host continental radicals without much anxiety, and Marx made his home in London for the rest of his years. The first of these were inglorious and hard. In spite of having pawned Jenny’s silver and sold her furniture, the family, with their servant Helene “Lenchen” Demuth, could afford to live only in overcrowded Soho—“a choice district for cholera,” as Marx observed. The note of indignant facetiousness in his mature writings can also be heard in his reports of household poverty: “A week ago I reached the pleasant point where I am unable to go out for want of the coats I have in pawn, and can no longer eat meat for want of credit.” When Franziska Marx, all of 1 year old, died of a lung condition in 1852, her parents required a gift of £2 from a sympathetic French emigrant to purchase her diminutive coffin. All told, three of the Marxes’ children died on Dean Street, two as infants and another before he reached the age of 10. Ill health and uneasy minds—Karl had liver trouble and was irritable, Jenny had weak lungs and was depressed—form the constants in the mid-1850s. Yet life doesn’t seem to have been completely dour. A Prussian police spy reported that “as a husband and father, Marx, in spite of his wild and reckless character, is the gentlest and mildest of men,” and Jenny later numbered her days in Marx’s “little study copying his scrawly articles” among “the happiest of my life.” For decoration, the family had wildflowers plucked from Hampstead Heath and, for entertainment, readings out loud from Shakespeare. Inheritances from better-off relatives (in a letter to Engels, Marx vulturishly reports “a very happy event, the death of my wife’s 90 year old uncle”) occasionally improved the quality of the family’s lodgings, but the Marxes always remained hard-pressed people with genteel standards. The daughters could not consider paid work, needing to learn foreign languages and the piano, the better to make eligible matches. From 1852 to 1862, Marx earned his living as a correspondent for the New-York Daily Tribune, at the time the newspaper with the largest circulation in the world. In his hastily worked-up English, he turned out twice-weekly columns, mainly on European affairs, which the ever-loyal Engels sometimes composed for him. Though Marx would rather have been producing books, his decades as a journalist lie behind much of his special character as a writer, his brash phrase-making and wide and ready command of information setting him apart from other major economic thinkers. (Keynes, who wrote many articles for The Times of London, supplies a partial exception.) If Marx is at once the grimmest and most abstract and the liveliest and most entertaining of theoretical minds, this is partly because the philosopher was also a newspaperman. Economic distress stalked the family until 1863, when an inheritance from Marx’s mother purchased some relief. If he’d died before this time, his name would hardly be known; by the mid-1860s, almost none of his earlier writings was in print. Having announced that he was laying a new intellectual foundation for socialism, Marx proceeded to publish A Contribution to the Critique of Political Economy, which even his friends found disappointing—a sort of throat-clearing for a speech that remained unpronounced. Marx next wasted a year on Herr Vogt, a 300-page polemic against a fellow radical German émigré. Were he alive today, his friends might describe him as a brilliant guy with misplaced priorities. As with many writers’ lives, the consequential years were outwardly the least dramatic. Between 1863 and 1867, Marx worked hard, often in the Reading Room of the British Museum, on the book he would call Capital. The long and miscellaneous work remains indelible for, at a minimum, its account of how commodities disguise social relationships among human beings as price relationships among things; its location of the essence of profit in unpaid labor; its close description of the English workplace; and its tracing of the arc of capitalist history. How does that arc bend? Capital is money that purchases labor power and means of production for the sake of producing commodities that can be sold for a greater sum of money than was initially advanced—and this simple concept contains the germ of a capitalist earth. (Marx imagined Capital as the first of six books, the last of which would anatomize the “World Market.”) Wealth acquired prior to capitalism through acts of plunder or “primitive accumulation” becomes capital once submitted to competition for private profit. Capital accumulation, in which future profits gather atop past profits, is then erected as the law of society. Over time, the compulsion to cheapen commodities, and thereby maximize profit, by reducing labor costs causes the ratio of machines to workers in production to rise. It also concentrates wealth in proportionally ever-fewer hands and renders a great part of the population unemployed and, from the point of view of capital, superfluous. Marx’s anticipation that working-class organization would keep pace with and, at length, overcome capitalism seems, from the vantage point of today, motivated by too much hope and not enough logic. His theory cogently implies that as technical productivity increases the industrial proletariat will eventually shrink as a proportion of the total workforce, much as it has done. What it fails to explain is how other sorts of workers— whether service-industry employees in rich countries, or wageless denizens of the “informal economy” in poor ones—might develop the kind of revolutionary class cohesion that he expected of factory hands. Marx’s so-far mistaken expectation of working-class revolution is the tragic flaw in his outline. (E.M. Cioran once described Marxism as “the sin of optimism.”) But the rest of his sketch of history remains remarkably prescient, and from Robert Brenner and Giovanni Arrighi to Jason W. Moore and Nancy Fraser, it has grounded many of the most persuasive visions of our own moment. Two pervasive shortcomings of Stedman Jones’s approach are on display in these lines. The first is a tiresome habit of pleonasm: Here is an author who will never say “establish” when he might say “succeed in establishing” or “logical” instead of “logically compelling.” A graver fault is tendentiousness. The lines above furnish one small example. From Stedman Jones’s biography, you wouldn’t know that Marx’s argument that capitalism has a tendency to reduce the share of labor income relative to capital income has nothing to do with any absolute “immiseration” or impoverishment of workers. Over recent decades, Marx’s thesis has been sufficiently reinforced both by statistics on income distribution and by non-Marxian theoretical work (e.g., Piketty) that it won’t do to present it, without explanation, as a gaping hole in his case. Karl Marx: Greatness and Illusion looks to be the most substantial intellectual biography of its subject yet written. For this reason, it’s too bad there isn’t more lucid and compact summation and less clothy, prejudicial paraphrase. Marx’s last decades brought some measure of satisfaction and recognition. The Civil War in France, his defense of the short-lived Paris Commune of 1871 as a harbinger of communism, attracted unaccustomed attention, and Capital began to be acknowledged as a work of the first importance. The rediscovery of The Communist Manifesto was sparked in 1872, when the German government tried several leaders of the Social Democratic Party (SPD) for treason; the prosecution read the offending document into the court record, enabling it to be published legally in Germany for the first time. The political climate for radicals was changing, as secret societies gave way to mass parties. Marx became an effective leader of the collection of radical and trade-unionist groups known as the First International, in spite or because of his penchant for falling out with comrades of comparable brilliance. (Lassalle and Bakunin are the main instances.) At a London conference in 1871, he advocated a women’s section of the International Workingmen’s Association, as it was officially called. Less admirably, he and Engels the next year encouraged the breakup of the International: Marxist socialists on one side, Bakuninite anarchists on the other. The split is regrettable not only because it divided the strength of the left, but because the gravamen of each side’s critique of the other was correct. The anarchists were naive and impractical about political organization, as the Marxists alleged. And Marxism was susceptible to authoritarianism, as Bakunin argued and the 20th century demonstrated. If Stedman Jones unfairly criticizes Marx’s economic ideas, he is right to stress the fatal ambiguities of his politics. In his 1875 polemic with Lassalle over the program of the SPD, Marx showed himself indifferent to “the old democratic litany familiar to all—universal suffrage, direct legislation, popular rights, a people’s militia, etc.”—that in previous decades he had endorsed. Democracy, he implied, would come after the revolution, not before it. (The notorious phrase “dictatorship of the proletariat” is usually misconstrued: Marx took bourgeois democracy to be one kind of class dictatorship, while socialist democracy would constitute another kind. Presumably, once the exploiting classes were dissolved, full democracy could arise.) Marx’s confusion over the strategic value of democratic protocols prior to revolution has haunted the Western left ever since. Many 20th-century Marxists took these brief and tentative texts as a warrant for socialist revolution in the Third World. Setting them against Marx’s earlier “stagist” notion of the advent of socialism through the fulfillment of capitalism, Stedman Jones taxes Marx the political theorist with illusion—one of the words of his book’s subtitle. But the other is “greatness,” an apt word not only for the conclusions Marx reached, but for the questions he formulated and left unanswered. In truth, it is no more clear in our time than it was in Marx’s how socialism will come about in either developed or underdeveloped countries; what is clear is that for humanity to have a decent future, it must come about. Here lies the abiding dilemma of the left. Marx died on March 14, 1883, from a hemorrhaged ulcer on the lung. He had survived his wife Jenny and also, heartbreakingly, his daughter Jenny, the eldest and best-loved of his children. The steady diet of grief administered across Marx’s life by the deaths of siblings and offspring may explain the mixture of steeliness (he could hardly pause to mourn) and compassion (he could hardly cease to mourn) characteristic of him as a thinker and a person. At Marx’s funeral, Engels gave a graveside speech to the 10 people present: “His name will endure through the ages, and so also will his work.” Stedman Jones refrains from quoting this forecast, which looks to have been correct. By any reasonable criteria—the fascination of his person, the achievement of his work, the scope of his influence—Marx counts as a great man. But there exists no great full-scale biography of him, capturing his spirit and ideas in their complexity. In his studious reconstruction of Marx’s social milieu and intellectual formation, Stedman Jones comes close at times, but he imparts little of the enthusiasm, anxiety, hope, and dread that Marx can only have felt as a person who, like anyone else, had to live his life as a project and try to understand it as history. Stedman Jones seems to take for granted Marx’s posthumous eminence in a way that Marx, even at his most grandiose, naturally could not do himself. The result is a story deprived of the drama of uncertain expectation that informs any life, especially one devoted to the hypothesis of a new kind of society. And yet the shape of the story—as singular, jagged, and intent as the key to some door—still comes through, a bit as if you were reading a great novel in what you suspect is a so-so translation. What would a properly Marxist life of Marx look like? Jean-Paul Sartre, in his Marxist phase, worried about the problem of biography. In Search for a Method (1957), he presents individual human life as the zone of two overlapping but incommensurable truths: On the one hand, an individual is a creature of psychology and the product of his family, and, on the other, a creature of history and a product of society. Everyone knows both things are true at one and the same time, but rather than comprehending people as instances of that single substance that Sartre calls “History,” we understand them alternately as psychological or social specimens, the broken halves of our knowledge lying side by side. A Marxist biography of Marx would at the very least de-emphasize the role of Marx himself in fashioning the unique person that he was. It was one favorable accident that he received a supremely good education at a time when most of Europe remained illiterate; it was another that the distinct strains of thought braided together in his work— German philosophy, English political economy, and French socialism, in Lenin’s famous summary—were still new enough in the mid-19th century that all three could be mastered by a single person, especially if an exile’s life familiarized him with the trio of respective countries and languages. Intellectual monuments are as a rule also the work of forces beyond the author’s own, and people other than himself. Marx was assisted in his labors by two intimates above all: Friedrich Engels and Jenny Marx. Along with encouragement and collaboration, Engels offered money, not to mention organizing and editing the posthumous volumes of Capital. For her part, Jenny kept Marx’s home, family, body, and self-belief intact through what Marxist feminists call care work—an element of capitalist society whose importance, unlike that of money, Marx didn’t dwell on. Mary Gabriel’s Love and Capital (2011), a joint biography of Karl and Jenny, does much to illuminate Jenny’s indispensable contribution to Marx’s heroic scribbling and to begin this kind of work. Another decisive piece of good fortune for Marx’s ideas was that he wrote in German, which made his thought easily accessible to the emerging parliamentary left in his native country. After 1875, the German Social Democrats were declaredly Marxist and became crucial in spreading his work. Had a French party, say, acquired the same stature as the SPD had, today there might be more Proudhonists and fewer Marxists. In such a case, Stedman Jones would have better reason to describe Marx as a man of the 19th century, as Sperber also did in his biography. But as the recent profusion of biographies itself suggests, Marx’s life exerts an abiding fascination today. At the same time, Marxist thought is also enjoying a renaissance. The allure of Marx in our moment is no longer that he’s regarded as the infallible prophet that Stedman Jones polemicizes against in his introduction. In the West, Marx the lawgiver disappeared, even as an article of orthodoxy, decades ago; by the mid-1970s, when Stedman Jones was still at the New Left Review, the journal’s editor, Perry Anderson, wrote, “The immense intellectual and political respect we owe to Marx and Engels is incompatible with any piety towards them.” This attitude is, if anything, even more pronounced today among leftist intellectuals and activists who carry out their work with Marx in mind. Marxism endures as a research program and as a political project, useful to present struggles more for a battery of inescapable questions than for a few settled conclusions.